Lovely photo of a horse hugging a girl. I am convinced this is real because someone commented that their horse did that. This is such a feel good photo. AND it is the Chinese Year of the Horse! I found this photo thanks to a tweet by Becky @TXHorseRescue who runs Becky’s Hope Horse Rescue a 501c3. I wanted to pin it so I asked Becky if it was posted anywhere. She replied, as you can see in her tweet that someone sent it to her so she didn’t know. I did a search and found that Huffington Post had picked it up and sourced it from Imgur. I could not find any posts with a photographers name. So Imgur gets the source. If a photographer would like to claim this, please let me know as I would love to give you credit. 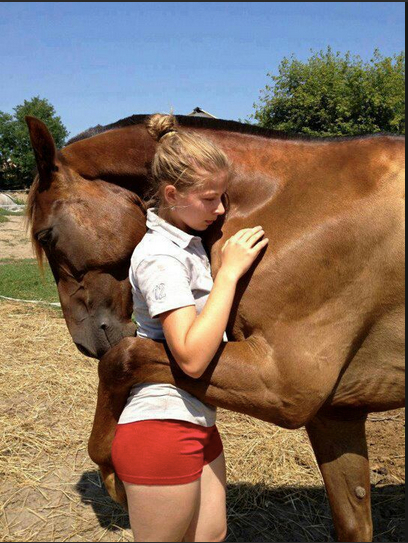 Dazzled by this hugging #horse photo. Mahalo Becky @TXHorseRescue pic.twitter.com/Bum69mwc3d Is it posted somewhere I can pin to Pinterest? Much thanks for the RT’s! I always try to find photo sources before I post them. In the interest of photographer IP (intellectual property) it is just the right thing to do. Becky’s Hope Horse Rescue in Texas looks like a wonderful project. I have been hugged by a labradoodle. Did you know they stand up and put their arms around your neck?